The question of the day is how will Obama turn his record of 6.2 million job losses into a positive number by the end of his four-year term? G.W. Bush cut taxes in his third year, which led to 51 month’s of positive job growth and the creation of 7.3 million jobs (not saved, just created). Obama will commence his third year (2011), 6.2 million jobs in the red, by imposing a tax hike. Obama is still out on the campaign trail trying to justify his failed economic policies by implying fallacious ideas like how the $80 billion auto-bailout saved the industry. The other day he was boasting about how his policies single-handedly created 55,000 new auto industry jobs, but he failed to mention that the same industry has hemorrhaged 400,000 jobs since 2008 (per Lawrence H. Summers). For the record, that means he’s still 345,000 auto industry jobs in the hole. Whether Obama cuts or raises taxes will have no positive effect on the economy. Obama could cut the top tax rates down to 28%, like Reagan, but it would still have no effect. Why not? Because one of the keys to positive economic growth is confidence. There is no confidence in Barack Obama, period. Obama squandered his credibility from day one. His recovery plan failed to contain job losses. His promise to cut taxes for 95% of Americans while accelerating the National Debt to historic proportions is not possible within the realm of human reason. His imposition of a health care mandate despite the will of the majority of Americans sealed his fate. There is no confidence in the president, or in his policies. Confidence will only begin to return when there is a shift in the balance of power. A change in the leadership of both houses of Congress is step one. Step two is the removal of Obama from the White House. What the facts show (and what is certain) is that since Obama took over the reigns of power, the economy has lost a total of 6 million, 243 thousand jobs. What we don’t know (and what remains uncertain) is which Obama policies are even capable of breakeven. Breaking even means creating 6.2 million new jobs. Saving the job market from further deterioration is a given, not a grand accomplishment. Obama needs to aim a lot higher. 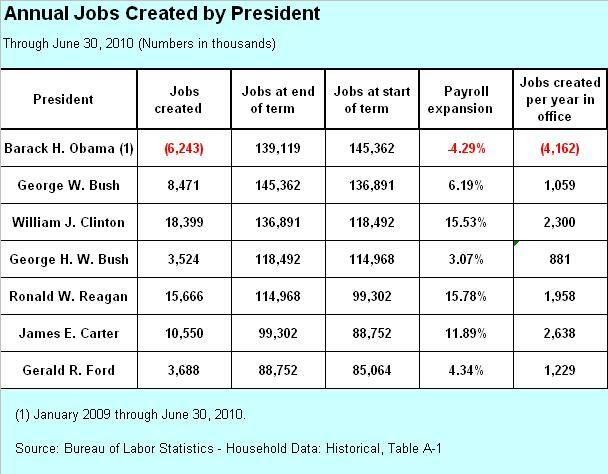 Even if he were to actually create 6.2 million American jobs, Obama would still be considered a failure. Do you have enough confidence in the rules of the game to be able to develop a winning (or survival) strategy? Under the present administration, the rules are not clear. Are your taxes going up next year, or not? Do you have to buy health insurance, or not? Will your health care costs continue to rise? Will your social security and Medicare benefits be cut? Will the government continue to run budget deficits after raising taxes? Even if we knew for certain that the answer to all of the above was affirmative, it wouldn’t make us more confident. There is no confidence, and when there is no confidence, jobs begin to perish. As the website Liberty Works correctly points out, in Bush Tax Cut Myths and Fallacies (1), the Bush tax cuts of 2003 led to quantifiable job growth. In fact, within 3 months of passage jobs were being created, and by the end of 2007 a total of 7.3 million jobs were created. Although progressives like Obama claim that this never happened, the facts are the facts no matter how twisted ones ideology. Thus, if we are comparing Obama and Bush, it should take roughly 3 months for a positive policy to show positive results. The American Recovery and Reinvestment Act (ARRA) was implemented in February of 2009, and 17 month’s later we are 6.2 million jobs in the hole. That’s a clear indication that the ARRA has failed. As Mark Perry points out, in Tax Cuts, Tax Hikes, It’s All Relative, tax cuts and tax hikes are pretty much relative. We are historically in a period of low tax rates. So if top tax rates go from 35% back to 39.6% it probably won’t kill the economy, but neither will it spark any positive growth. What will be affected is the level of confidence in a government that needs more and more but still can’t balance a simple budget. …Certainly, compared to the “Clinton tax hikes” that took effect in 1993 and raised the top marginal income rate to 39.6%, the reductions of the top tax rate to 38.6% in 2002 and 35% in 2003 were “tax cuts” (see chart above). 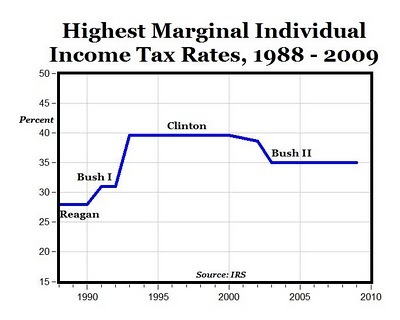 But if you go back further and compare the Bush tax rates to the highest marginal tax rates under Bush, Sr. (31%) and Reagan (28%), couldn’t the Bush II tax rates more accurately be referred to as the “Bush tax hikes”? 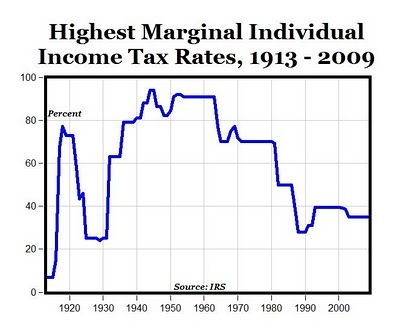 Of course, the tax rates were much higher before 1988, here’s the full history back to 1913 in the chart below. Compared to most of the tax rates between the 1930s and the 1980s, couldn’t the Clinton tax rates also accurately be referred to as the “Clinton tax cuts”? It’s not about tax hikes, it’s about how to grow the economy and how to create jobs. Clinton raised taxes during a period of economic growth, not to recover from a recession. If Obama can create jobs in a recession by raising taxes, then ‘God bless him’. But if Obama’s tax hikes lead to further job losses, forget about it. Fool me twice, shame on me. Fool me three times, and I must be a fool. 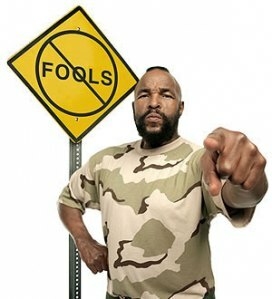 Yet fools we are not. We are asking all our supporters to attend C.E.O. Burrell Ellis' “Focus DeKalb” being held Monday August 9, 2010 at 6:30 PM at Georgia Perimeter College, Dunwoody. Our concerns are: At a time when all DeKalb County employees, especially Public Safety, in particular the police department, have lost all merit pay increases, do not receive a cost of living increase, lost the payment of unused sick leave, lost all holiday pay, are being forced to work holidays with no pay (at 10% reduction in pay, and a 30% reduction in pay in November), why is Mr. Ellis and all county commissioners, including their staff, who are county employees, receiving holiday pay? Why did Mr. Ellis and other commissioners believe their staff deserved pay raises as much a 34%, or $10,000.00 per year, when public safety pay is being reduced?